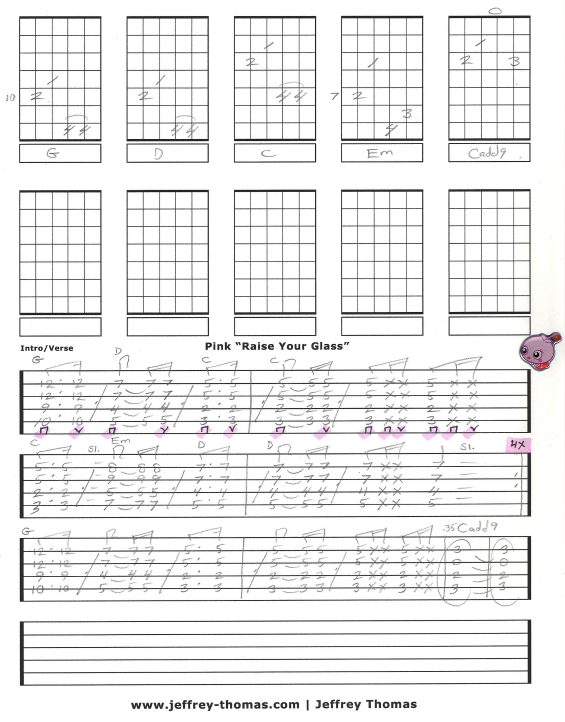 “Raise Your Glass” by Pink free video guitar lesson and tab. I have written out the intro for you so make sure to download the tab and watch the video here (Raise Your Glass). My ears tell me the guitarist is using a harmonizer on the studio version of this tune. I have not heard any live performance where the guitarist plays the intro how it is on the studio take. I wrote out the proper chords as they sound on the recording without a harmonizer. Want the guitar tab for free? Just send in your email address using the form provided. Looking for the best online guitar lessons? Fill out the Schedule A Free Lesson form to set up a free Skype guitar lesson today. I hope you enjoyed my free guitar tab for “Raise Your Glass”. This tab shows just the intro of the song so contact me if you would like to finish it. Make sure to check out my Online Video Guitar Lesson Archive and full Guitar Tab Archive.